A few months prior to losing my book Australian artist Mark Shorter, under the character Tino La Bamba, was commissioned by Christchurch Gallery, The Physics Room to perform a 72-hour project. This involved digging a hole in an empty 323 Manchester St lot, from the 9th to the 12th of December 2015. I am now back in Christchurch. 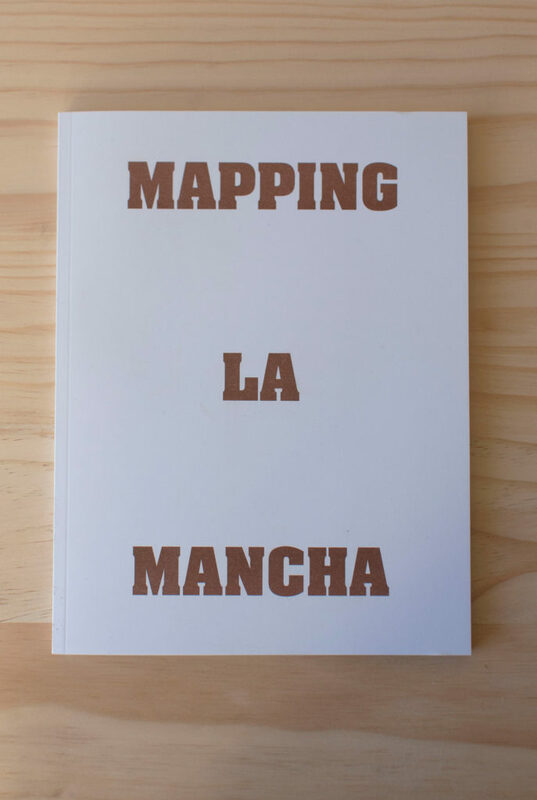 On the 6th of August I attended the book launch of Mapping La Mancha, the accompanying publication to Shortner’s work. Tino La Bamba illuminated by his screen is called on Skype, supposedly deep underground still digging. He tells us time for him has a different meaning. He feels time the way a rock does. The book is designed by University of Canterbury Graphic Design student Luke Shaw, Risograph printed at Ilam Press, and bound at McHargs. The 86 page book contains photographs taken by Daegan Wells, introduction text by Melanie Oliver, essay by Nic Low, and a few plan drawings of the hole. As an object, the book is about the size of a shovel blade. The inside stock is 80gsm Munken Print cream; this paper has noticeable show through. However, this doesn’t deter from the book, as it would with text. Rather it leads to a few small moments of overlapping, the ghost of one image on the current page. 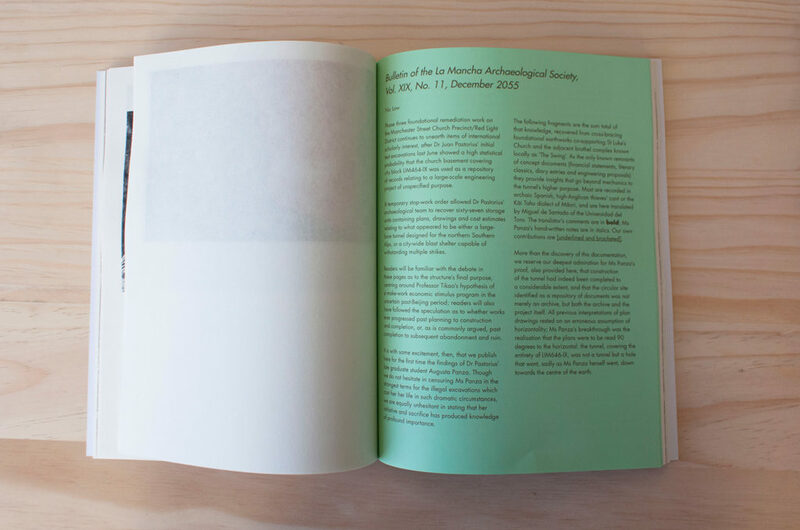 Shaw in his design of this book experiments with different compositions, perhaps owing to currently being a third year Graphic Design student at the University of Canterbury School of Fine Arts. Most images sit alone within a frame on the page, often slotted into the top of the frame leaving the bottom empty. However Shaw continually breaks his frame, pushing the images around the page and even over the border. Editing of the photographs is similarly inconsistent: different sized dot screens, colours (brown, black, red with one out of place three colour spread), framing, and cutting out. This project doesn’t seem like it needs clean graphic design though, and in a way it works with the images and fragmented essay. There is no consistent rhythm to the book; instead it feels disjointed—like a digger throwing up new dirt. Blank pages break the repetition and the different treatment of the photographs seems to be used so the reader can’t settle. Like Tino La Bamba, we feel the passing of time in the book in a disrupted, uneasy way. There is even a small piece of the trickery where Shaw had used a cut-out of a bystander from one photo and placed him in the hole. Sometimes the book feels a little too messy but more often than not it pulls it off. What began as a commitment by one man to digging a hole, became an evocative pursuit that encompassed multiple ideas of desire, journey, tragedy, survival and existence. Obviously I could not be there for the performance, however Luke Shaw, Daegan Wells, and Melanie Oliver could. My experience of the event is through the book. Text, photography and graphic design contain the performance. The book succeeds in documenting and bringing up the major ideas from the performance beyond just saying what they are. Much of this is due to Low’s writing, however its ideas and themes are bounced around inside the book. Nic Low sets the date for his fictional essay as December 2055 and looks back on the digging. He creates a past where the hole became an extended project, drawing in more people and eventually becoming a large scale engineering project. He creates folklore (fakelore) to again make us aware of the project’s context. 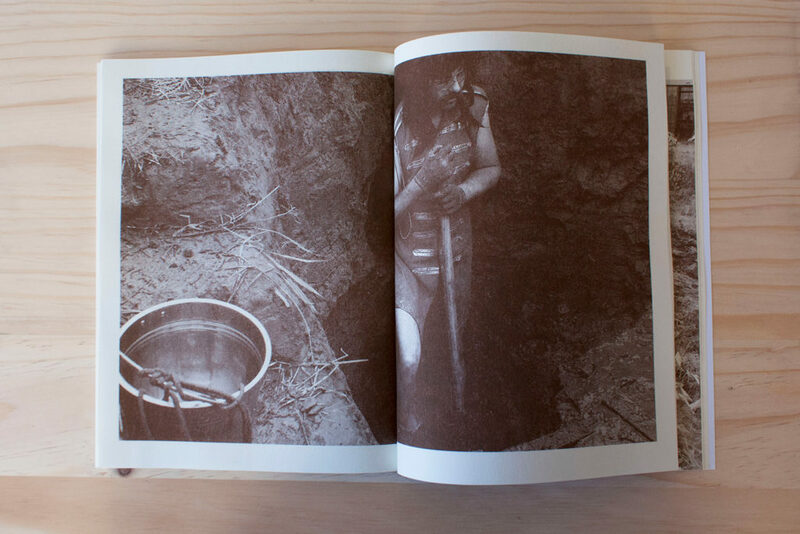 Low also draws out links between Mapping La Macha and Frank Sargeson’s short story The Hole That Jack Dug, in which the character Jack digs a large hole in his yard, as a way of expressing internal conflicts and frustrations. Mark Shorter’s hole is similarly a form of expression. And even though we might draw different things from the holes of Mark, Jack, and William in The Nuclear Age, they all relate to the attempt to control one’s space and time. Recently I saw on the news that a message in a bottle was found washed up in the Chatham Islands. It had travelled 21 years from Picton. The artefact inside survived intact enough for the finder to track down the original sender, now 29 years old. Did someone pick up my copy of The Nuclear Age? 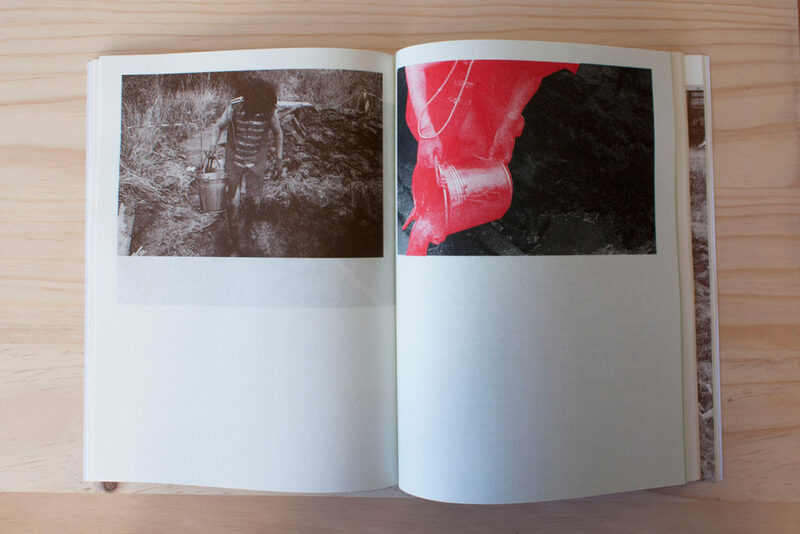 How will the finder see the book’s documentation of nuclear terror? In 21 years where will Mapping La Mancha be? Should I reopen it then I could still glean the context of the work and the history of the action. The book now feels time like a rock, it may erode but the ideas and meaning behind the project will remain. 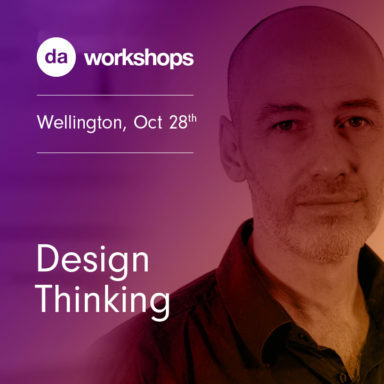 This full-day workshop explores Design Thinking, a deeply human-centered methodology that taps into abilities we all have but that get overlooked by more ‘common’ problem-solving methods. This approach allows people (even non-designers) to use creative tools to address a myriad of different problem-solving or innovation challenges. 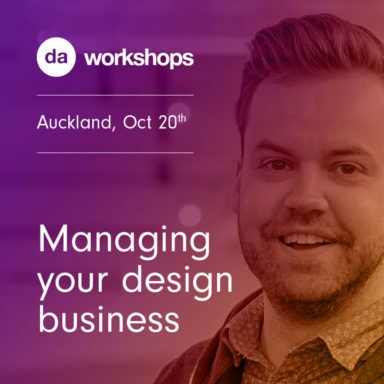 Join Mark Osborne from Roll and Asheel Bharos from Rightway in an evening seminar looking at the systems behind managing your design business. Mark will talk about transforming your design business with software, moving beyond Adobe Creative Suite and Microsoft Office and the future - where is business software heading? Asheel will focus on the challenges around cash flow and forward thinking around financials - particularly where jobs last several months and the need to track partial payments and WIP. He will also discuss reporting on efficiency and understanding project profitability as well as profit and loss.